The holidays aren’t even halfway through and I’m already feeling bloated from all the food I’ve been consuming. Anyone else feel the same way? My baking bonanza the last week has meant I’ve had no time for anything else. Hence explains my empty fridge. I did manage to find some eggplants that I almost forgot about, and having hardly any energy left to cook (let alone eat), I made a quick and light dinner for myself the other day. Steam eggplants. 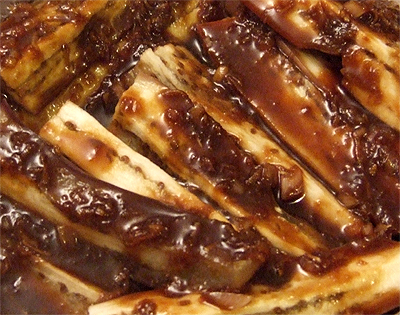 Whip together soy-miso dressing. Eat. It was fast. It was easy. It was yummy. Makes a fabulous light dinner or an excellent side dish in less than 20 minutes! Cut off and discard the eggplant stems and cut them in half width-wise, then quarter the halves lengthwise so that each eggplant gives you 8 pieces when cut up. Place eggplant in a heatproof dish and place dish on a steamer rack in a wok or deep pot. Steam eggplant for 10 to 15 minutes or until soft. While eggplant is steaming, heat the sesame oil in a small saucepan over medium heat. Add shallots, ginger and garlic and sauté until fragrant and shallots have softened, about 3 to 5 minutes. Add the soy sauce, sugar and miso paste and stir until miso and sugar have dissolved. 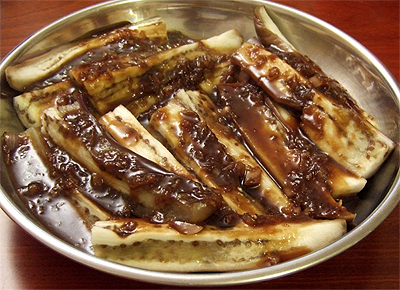 Pour dressing over steamed eggplant and sprinkle with toasted sesame seeds before serving, if desired. Posted by Bonita at 8:41 p.m.
kaeRock December 18, 2009 at 1:55 p.m.
ooooooh that looks so good! You're making my mouth water!